On Thursday, November 8, 2012, Hieromonk Roman (Krassovsky), recently appointed Acting Chief of the Russian Ecclesiastical Mission in Jerusalem of the Russian Orthodox Church Outside of Russia, accompanied His Eminence Archbishop Mark of Berlin and Germany, Overseer of the REM, on a pilgrimage to Jerusalem. 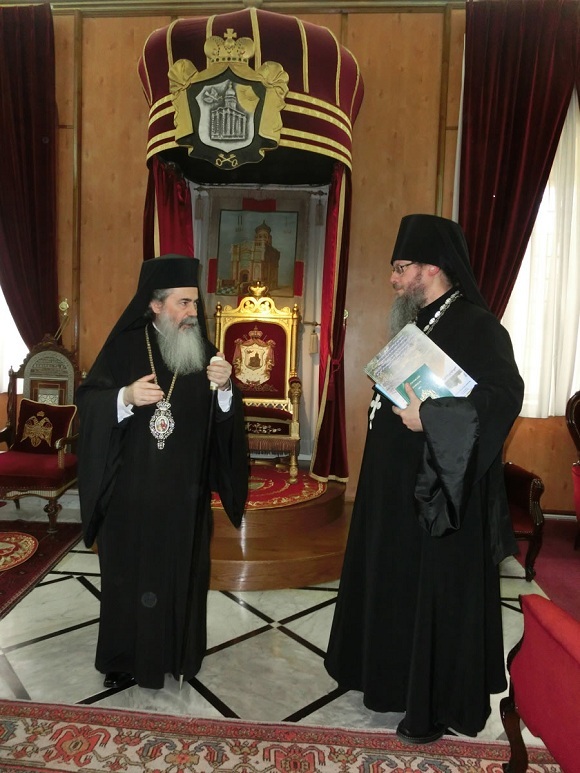 Despite the fact that Fr Roman’s arrival coincided with the first visit to the Jerusalem Patriarchate of His Holiness Patriarch Kirill of Moscow and All Russia, he already managed to meet with the clergymen, abbesses and monastics of the convents in Gethsemane and the Mt of Olives, and discuss ongoing affairs of the Mission. He also participated in divine services and other events connected with the pilgrimage to the Holy Land of the Patriarch of the Russian Orthodox Church. Archbishop Mark introduced Fr Roman to His All Holiness Patriarch Theophilos III of Jerusalem and All Palestine, who blessed Fr Roman’s new obedience.